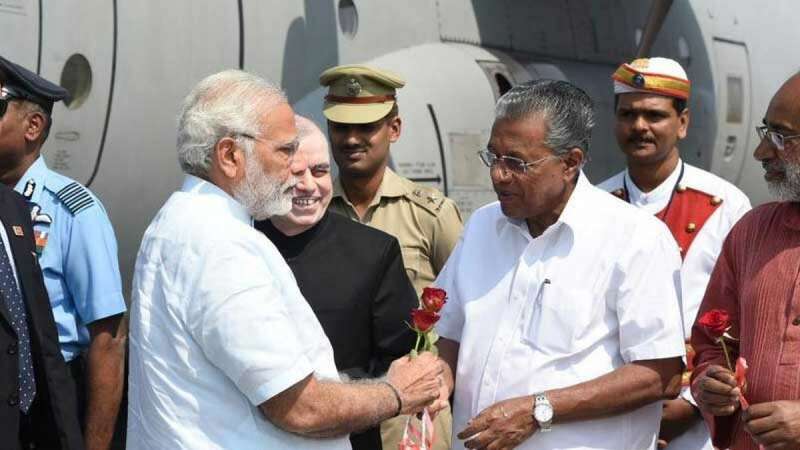 New Delhi : Prime Minister Narendra Modi arrived here on Tuesday to visit coastal villages in Kerala that were ravaged by Cyclone Ockhi. He later visited Tamil Nadu. Modi flew in from Lakshadweep, where the cyclone destroyed properties. Kerala Chief Minister Pinarayi Vijayan received the Prime Minister. Modi then left for Kanyakumari in Tamil Nadu by helicopter. Hundreds of fishermen have lost their lives and several are yet to return after Ockhi struck the southern coasts on November 30. Modi was expected to return here around 5 p.m. and spend half hour in Poonthura village where he would meet the families of the affected community. He will also interact with Vijayan before leaving for Delhi. More than 70 fishermen from the southern districts of Thiruvananthapuram and Kollam died in Ockhi while more than 250 remain missing.